Description: Helpers are attached to the WB Apollo at Carbondale, PA. Description: An 8 unit Mercury in Bing Yard! Description: LASE, ALL of him, arrives at East Deerfield East over the Connecticut River bridge. Description: LASE's power after having dropped the 209. Description: Bow coal train arrives in Greenfield on the Fitchburg route via the Hoosac tunnel. White building at right is the former B&M offices. Description: Bow coal train rounds the curve approaching Greenfield East. Description: D&H 7324's coat of blue paint has been almost completely worn away revealing the its former Lehigh Valley Cornell Red colors at CP-BD in Binghamton, NY 3/1985. 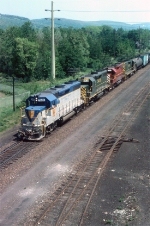 Description: B&M power was not uncommon on the D&H, and only became more prevalent after Guilford acquired the road, along with those of Maine Central. Here are a pair of B&M GP38-2s leading a like pair of ex LV units from the D&H northbound at Bainbridge. Note the D&H "I Love NY" boxcar back in the train. Description: Eastbound PYPO crossing the Miller's River in Erving. Description: Some assortment of colors showing this day. Description: D&H GP38-2 #7324 at E. Binghamton yd. Description: When pushers were needed for a train going north, whatever was handy was drafted for the job. Today its an ex Chessie GP 30 pushing PYRP. No one here is complaining!! Description: The pushers seen at BD have trailed PYRP through Bevier St and are now getting started toward the tunnel. Description: MEBU rolls through Bevier St behind D&H 7314, and ex LV unit that is blue for the moment. As the years pass, the engine will show more and more of its original paint, so that it will eventually look like its former self. Description: PYRP has reached Belden tunnel, and the pushers that have assisted from Bevier St, one each from Reading and LV, will cut off and head back home. Description: PYRP rolls through BD, and will momentarily be on the diamond. Todays power is divided between ex LV and RDG units, letting everyone in on the act. Description: An ex LV unit, now D&H, looks on at the remains of its old home as it passes between the semaphores at Tioga Center with a 53 car BUME. Standing orders were to run NYSW power head out when practicable. Sometimes it just wasn't. Description: This was down a side road off NY17C. There was a water supply plant there, but the road was often gated. It was open this day, and I took the opportunity to get BUME rolling through the pair of signals there. 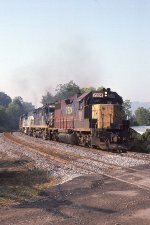 Description: BUME behind a Guilford painted GP 38 and NYSW power splits the ex Erie semaphores at Tioga Center. Description: An NYSW B40 leads PYRP into Hop Bottom, in the midst of the late June greenery that is so prevalent in Pennsylvania, one of the worlds largest hardwood forests. Description: PYRP rolls past the ex DLW station at Kingsley. Built during the construction of the famed Cut Off around 1912, the building was recently updated to serve as the northern end point of Steamtown excursions, which would start running here the following month.